PORTLAND, OREGON — The big buzz on the first day of the APEX Expo this year is that BAE Systems had achieved the unthinkable: early window content from “a major Hollywood studio” streaming to passenger devices using its IntelliCabin technology. Indeed, Jared Shoemaker, BAE’s director of cabin systems, explains to RGN that even their customers didn’t initially believe it. But the big question is what “major Hollywood studio” means. “Is it one of the big six?” RGN asked Shoemaker. “Yes. We actually have two of the big six now,” he confirmed. In response to showfloor scuttlebutt, RGN specifically asked whether the content provider was Marigold, and Shoemaker confirmed that it was not. The streaming will be both to airline-provided portables and to passengers’ own personal electronic devices — the latter, of course, being the big news, since relative newcomer and comparative minnow BAE is the first inflight entertainment provider to achieve early window content streaming to PEDs. As recently as six months ago, even Shoemaker was convinced that early window streaming would never happen. But now it’s only a few months from implementation. “We’re going to try to fly it in January or February,” Shoemaker says. So how did BAE do it? “Lots of work. Our head engineer has been working with the studios as basically his fulltime job for the last six months. We’ve changed parts of the IntelliCabin solution: how we handle content flow all the way from the studios to the passenger,” Shoemaker explains. It helps, of course, that IntelliCabin has a partner with experience dealing with content and security. 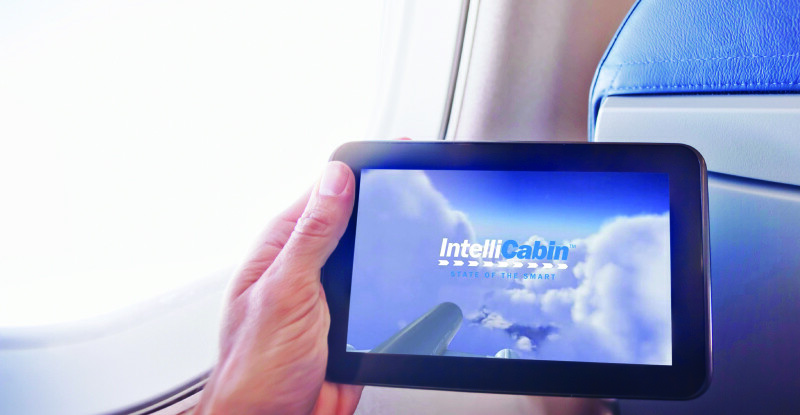 The airline-provided devices in the IntelliCabin solution are Samsung Galaxy Tabs. BAE Systems, of course, is a global defence and security giant, and does a significant amount of secure work for governments, corporations — and, indeed, for the safety side of the aviation industry. RGN posed the question of how much read-across there was between the ultra-secure work BAE does and the willingness of the studios to engage. “Adjacently, I think. Because of what we do on the defence side, and we do security work for the three-letter agencies, what I’d say is that we’re not implementing security algorithms from the defence side of our business. One, we couldn’t do that, and two, it doesn’t really make sense. The processes used to do that sort of work are the same processes that are used here. It’s very rigorous, and we follow a very rigorous process of understanding, validating and making sure data is flowing properly in a very secure manner, with lots of checks and double checks about what we do. “Even though what we’re doing is what view as Level E software, so it doesn’t require any certification, we develop a lot of Level A software that flies airplanes and provides secure communications. We use effectively the same process.” And, Shoemaker notes, it’s the same people too.